The Max. rated capacity of QY8D is 8000kg at 3.0m, and it has three-section hexagon boom profile. Difunctional single-stage haydrocylinder, high luffing speed; Variable speed type of hoisting system with grooved drum, driven by high speed hydraulic piston motor through winch reducer; rotating flexible and rapidly. Outriggers in the H-type, has a big footprints, and the outriggers could be operated simultaneously or separately. 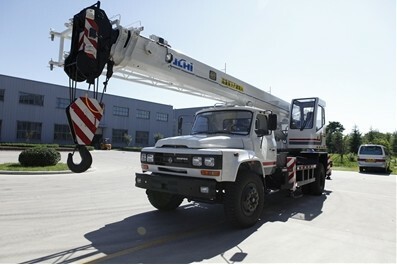 The whole crane equipped with automatic cut-off volume device, electronic scales, hydraulic locks, relief valve, balance valve, range indicator, which guarantee the safety. With its own characteristics, QY8D has a wide range of using, and meets the needs of various users.